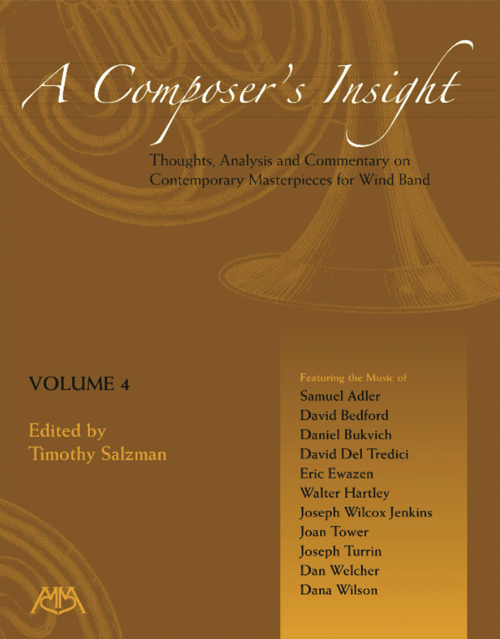 A Composer's Insight, Volume 4 is the fourth in a five-volume series on major contemporary composers and their works for wind band. Included in this initial volume are rare, “behind-the-notes” perspectives acquired from personal interviews with each composer. An excellent resource for conductors, composers or enthusiasts interested in acquiring a richer musical understanding of the composers' training, compositional approach, musical influences and interpretative ideas. Features the music of: Samuel Adler, David Bedford, Daniel Bukvich, David Del Tredici, Eric Ewazen, Walter Hartley, Joseph Wilcox Jenkins, Joan Tower, Joseph Turrin, Dan Welcher and Dana Wilson.